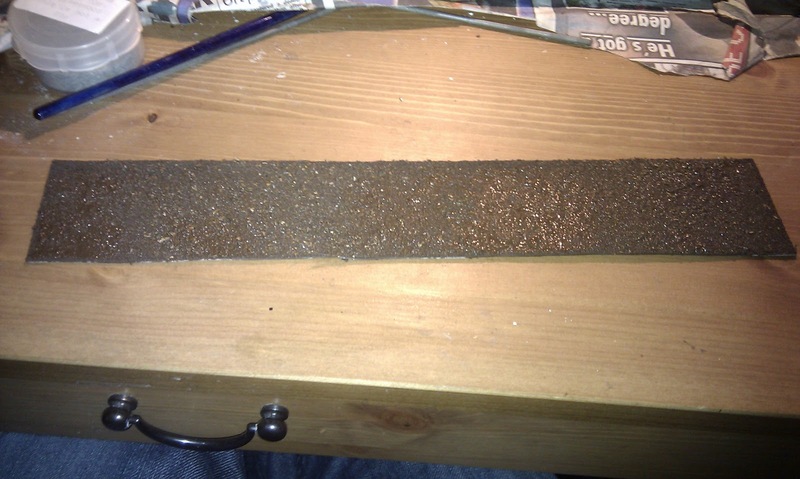 Lukes Gaming Blog: Cheap Roads from Vinyl Tiles. Cheap Roads from Vinyl Tiles. Roads are a necessity for anyone gaming WW2 and if you're gaming in NW Europe you need lots of them! I've been looking for a source of cheapish roads for a while. I've experimented with foam and felt but never been happy with the results. I tried making a few pieces from Plasticard and whilst they looked good they where unfortunately only good for flat tables, quite expensive at £1.50 for an A4 sheet, and it's a bugger to cut the curves. Today however I think I may have stumbled on a solution when I wandered into the wargamers treasure trove that is Poundland. They sell Vinyl floor tiles in packs for 4 for (you guessed it) £1, the tiles are 30cm square. These are cheap, flexible, a doodle to cut with household scissors and have an adhesive backing so you don't even have to worry about covering them in glue. I bought 2 packs to experiment with. After this I popped over the road to Wilkinsons to buy some more supplies. First I picked up some of their bird sand from the pet section. This is always a good buy and only costs £1 for a Kilo of the stuff. Considering that GW's modeling sand is now £5 for 100 grams , the wilkos alternative is quite literally 1\50th the price of GW's. Doesn't that make your head spin? Also I looked at their art section. They do some useful and cheap acrylic paints that are good for terrain. 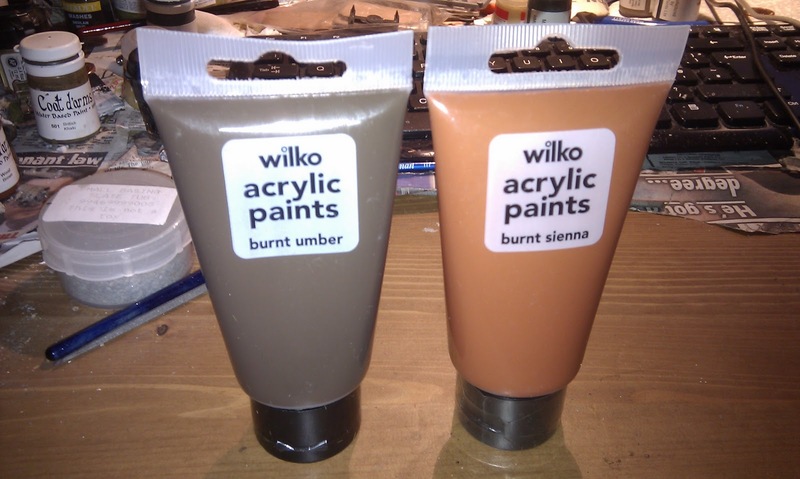 A 75ml tube of their 'burnt umber' paint is 90 pence and a almost exact match for GW's Scorched Brown. This would be an excellent base color for my roads. I also grabbed a tube of their 'burnt sienna' color which I thought looked a good terracotta color for roofs on model buildings. I've not tried it yet but I'll probably post something about it in the future when I do. After cutting the tiles into pieces I removed the backing and covered them in sand. It adhered nicely, thought there where a few small bald patches that I touched up later with PVA. Once painted though this should seal the sand nicely. 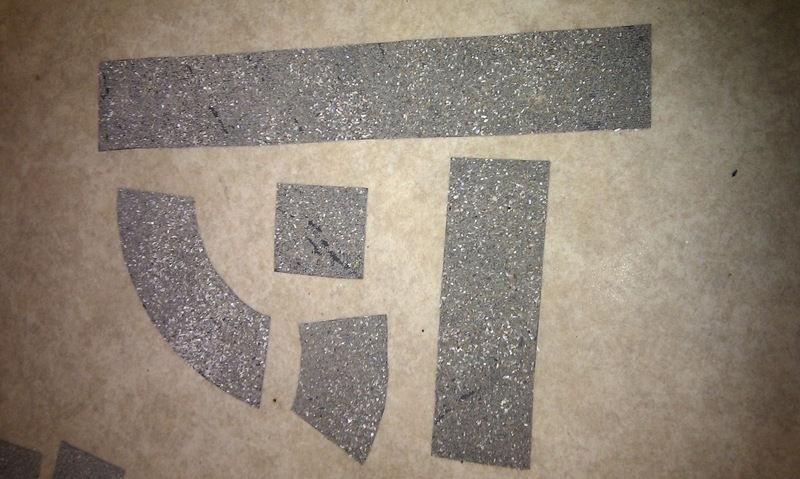 A few of the pieces after they had been sanded. One of the pieces after being painted. Tomorrow I shall drybrush and flock the test pieces and post the reults! Sadly, our poundshops (dollar stores) never seem to have paint. I found tiles at our DIY store and bought them with the intention of using them as tiles form my table to easily switch out terrain. They are a bit flimsy to my liking for bigger terrain tiles but they did allow me to really try out some techniques for table making. I never thought of using them for roadways... Argh! Thanks for the tip. Quest for a quickshade alternative.